Forgotten narrow gauge line rediscovered! When in the course of research some months ago, a fellow Polish-railways-fan, Ian Simpson, and myself, came across a one-time PKP narrow-gauge line, previously unknown in Britain – we were somewhat amazed. We had not seen any mention of the line in any of the sources known to us to date, including the very useful Atlas Waskorotowek by Pawel Korcz. We felt like zoologists discovering a hitherto completely unknown species, alive and well in some remote part of the globe,. As with a considerable amount of Poland’s narrow gauge, the line had its origin in light railways laid down for military purposes in the First World War. Its standard-gauge junction was Belzec, nowadays in south-eastern Poland. In the earlier phases of WWI, the Austrian army – having invaded what was then Russian Poland – built a 600mm gauge military line from the s/g at Belzec, some 120 km in a north-north-west direction to Trawniki on the Lublin – Chelm main line. This Feldbahn flourished in late 1915, but was superseded early the following year by fairly closely parallel standard-gauge lines built by the Austrians – nowadays PKP passenger table 554, section Belzec – Zawada – Rejowiec. In January 1916, the military sold to the Austrian Imperial and Royal State Railways (Lemberg [Lwow] division), the first 11 km out of Belzec to Tomaszow Lubelskie, of their now redundant 600mm line, the rest of which was soon to disappear. Very shortly afterwards, the State Railways introduced a public common-carrier service on the 11 km which they had acquired. At first, it carried mostly agricultural products; but in summer and autumn 1916, the State Railways extended it to serve traffic sources a little further out. Initially, a further 2 km of the Feldbahn north from Tomaszow Lubelskie was taken over; then new track was laid due northwards for 7 km to a sawmill near Tarnawatka, which supplied the military. A little later, the line was extended another 7 km northwards to the town of Budy Dzierazenskie, the site of a brickworks, rail connection for which would expedite the distribution of its products. This final extension produced a 600mm gauge line 27 km long in total. The line remained in service after the end of WWI, and Poland’s regaining independence. Towards the end of 1918, it came under the management of the Ministry of Railways in Warsaw. In July 1920, it passed into the control of the Radom division of Polski Koleje Panstwowe. The line’s last appearance in the PKP public timetable in 1923, but with the annotation ‘Train service suspended’. Reputedly there are documents subsequent to that date, which refer to the dismantling of the whole line – thought to have taken place in 1924 or 1925. The Belzec – Budy Dzierazenskie line was thus quite ephemeral – the reason, no doubt, why few people knew about it in the UK. The line would seem a likely candidate for the dubious distinction of being the victim of PKP’s very first abandonment. From the sources that were available to us, the conclusion that the line had an official passenger service, would seem a little speculative. Whilst its appearance in the PKP passenger timetable would appear to be a strong argument in favour, it is likely that the carriage of passengers would have been a rather casual affair, and very much a matter of mixed trains. The sale in January 1916 to the State Railways of the Belzec – Tomaszow Lubelskie section, included three locomotives, of the standard military 600mm gauge Brigadelokomotiv 0-8-0T type, and ‘thirty wagons’. The locos concerned were military railway (HF) numbers HF 24 (Krauss 6939 / 1914), HF 428 (Jung 2334 / 1915) and HF 464 (Maffei 4596 / 1915). After the line’s closure, the first two locos were sold to an Austrian construction firm; their subsequent fate is unknown. The third machine remained in Poland, in non-common-carrier use, but went after World War II to the Birzava forestry railway in Romania, where it ran until 1962. Section 4 of the competition is now closed. What is this and where is it? Apologies for the somewhat serious and sombre nature of the last post. Most of our readers read BTWT in order to escape from the daily dose of depressing news dished by the mass media. The handful of BTWT readers who actually like that sort of thing are encouraged to to follow up developments in the Damian Green affair by clicking on the links at the end of yesterday’s article. Iain Dale, in particular, is posting regular analysis and updates on the story in his blog Iain Dale’s Diary. The four readers who share Dyspozytor’s concerns about the slowly tightening authoritarian screw might like to listen to a lecture by Naomi Wolf who claims that something similar is happening in the USA, or even to view her presentation (in 5 parts) courtesy of You Tube. And now for something completely different… ! Part 3 of the competition is hereby closed. 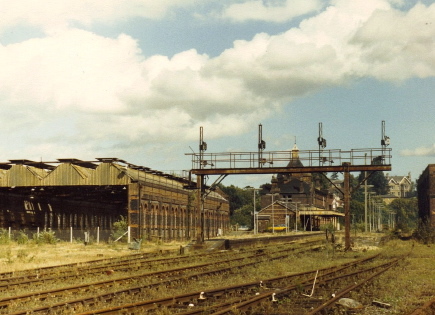 Congratulations to all who identified the location as Tunbridge Wells West Station in Tunbridge Wells. The location is now a Sainsbury’s supermarket and restaurant. Near to where the photographer is standing is the present terminus of the Spa Valley Railway. We acknowledge this post on the somerset and dorset blog (which has some excellent photographs) as the source of the picture. Stage 4 of the competition has a contemporary Polish theme. (In our recent poll, Polish railway news was identified by the majority of our readers as that part of our our editorial ‘mix’ which they wanted most of.) So what is the strange object in the picture and where is it. Clicking on the picture leads to a bigger version and clicking that expands it still further. There are lots of clues! Tomorrow we have a special treat, an article by guest writer Robert Hall about a hitherto unknown PKP-operated Polish narrow gauge railway. Have a great weekend! Painting out the GWR logo on a Great Western Railway delivery lorry at Paddington Goods Depot on 31 December 1947, the eve of the nationalisation of Britain’s railways. Photo originally in BR Western Region archives, retrieved via Jamd.com. Calls by railway trade unions, giving evidence a couple of days ago to the Commons Welsh affairs committee, for the renationalisation of the railways reminded us that 61 years ago The Guardian was warning its readers about the consequences of railway privatisation. The nationalisation of the railways on January 1 is going to involve drastic changes in organisation at once. That is made clear in the statement issued by the Transport Commission on the new structure. The Commission has been set up to assume control and ownership of all the assets to be transferred to the nation. At the end of the year the four main-line companies, which have existed since the amalgamations of 1921, will disappear. Under the name of British Railways they are to be unified under a single national command. At the same time the system is being divided into six regions – there may be more subdvisions later. The type of organisation chosen for the nationalised railways involves a radical change. The technique of management will be completely altered. The six railway regions will not be autonomous, as the four groups now are. It has been deliberately decided that there is no need for the type of officer whom the railways, like other commercial undertakings, describe as a manager. This decision cannot be viewed without uneasiness. It is a favourite idea of the Civil Service that administration is best left to specialists and that co-ordination can be entrusted to committees. This may have been a good idea when the Government machine was small. In more recent times it has been the cause of much weakness in public administration. During the war we learnt by trial and error that no person or body can ever co-ordinate the work of others unless given high and indisputable authority. The plan for the railways does not seem to have absorbed that lesson. It seems that little has been learnt by Sir Humphrey and his civil servant colleagues in the intervening 60 years. Around 16:35 GMT today, BTWT received its 50,000th hit. Since we started publication we have also received 241 comments. Our readers include people who work for Transport for London, Network Rail and a committee member of the European Heritage Railways umbrella body, Fedcrail. These are important milestones for BTWT, but there is also no reason for us to be complacent. In our first 5 months, our readership grew rapidly. In March we started with 912 hits and by July we had reached 7,628 hits. Over the next four months, our readership growth has levelled off, though we did have a ‘best ever’ month in October with 7,812 hits. This month we are averaging 238 daily hits. So we still have some way to go to reach our target of 1,000 daily views! Why 1,000? Because we believe that with such a readership we will have recruited core of 50 committed supporters who we can count on to ‘make a difference’ by helping with our letter writing campaigns, particularly those aimed at decision makers in Poland. So how do we grow the next 760 readers? The first step will be to improve the regularity and quality of our posts. Sometimes there is not enough time to prepare material to the standard that our readers have the right to expect. We need to recruit two sub editors who can feed in a couple of articles a week to give us more time to research and write up the remaining five. The next task is to fine tune our focus. BTWT started because we wanted to publicise some of the problems faced by Poland’s surviving narrow gauge and heritage railways. Since then we have mixed in articles about railway policy and politics in the UK and Poland as well as a few items about railway heritage in Britain and further afield. The results of our readership survey tell us that we have got the ingredients right, but we need to adjust their proportions. Much to our surprise, mainstream Polish railway news is by far the most popular subject with 89% of our readers wanting a daily, or every other day report. Polish heritage rail comes a close second with 69% of our readers wanting to read an article daily, or every other day. British news clearly has a place, but with so many sites covering the topic, it is clear that the majority of BTWT readers would like to read a quality piece once a week rather than a ‘me too’ article daily. So how about it BTWT supporters, is there a budding journalist out there who would like the job of BTWT World News Editor and also another who would like to prepare a weekly article about the British Railway scene? We can help set you up with news feeds to make the news gathering task as easy as possible. All you have to do is to write one article a week. We in turn would use the time gained to focus on writing quality articles on the Polish railway scene. If our recruitment campaign is a success and we complete our editorial team then we can renew our marketing efforts. So come on in and join us. Don’t be shy. Let’s reach 1,000 hits a day before the end of 2009 and make Beyond The Water Tower a power to be reckoned with. End of cheap long-distance trains in Poland? The Osobowe trains are the cheapest way to travel by train in Poland, the Pospieszne are a little more expensive, but still excellent value, and much more comfortable. They take forever and a day winding across Poland connecting exotic locations such as Szczecin and Rzeszow. Now the Przewozy Regionalne business is to be split in two. Those trains that run within one province, like the Wolsztyn-Poznan trains, will stay in Przewozy Regionalne. Those that run across provincial boundaries, like Lodz-Wroclaw, will go to a new operating company to be set up by PKP InterCity. Przewozy Regionalne itself is to be removed from the PKP Group of companies and administered by the local authorities. What this will mean for passengers is not clear, but PKP watchers fear the worst. In the short term PKP InterCity has promised that season tickets bought before 1 January 2009 for PKP trains will be valid on the same trains after 1 January. It’s also announced that it’s not introducing any price hikes and that Pospieszne trains will not be bound by its compulsory seat reservation policy. But its also apparent that rail travel will become less flexible with Pospieszny tickets no longer being valid on Osobowy trains and Osobowy tickets no longer being upgradable to Pospieszny. Long term, the prognosis for rail passengers is not good. What will happen to the inter-province stopping trains such as the Lokalny train from Lodz to Poznan? It doesn’t really fit in with the rest of PKP InterCity’s portfolio? But the train is well patronised and, using a more direct route, it takes about the same time to reach Poznan as the alternative of travelling by Pospieszny to Kutno and then EuroCity on to Poznan, for one quarter of the latter’s price! Once the dust of the transfer has settled, will PKP InterCity with its eyes on privatisation, want continue to run the long distance Pospieszny trains that run nearly empty across Poland mid-week, but are stuffed to bursting point on Friday’s and Sunday evenings? In an angry post titled, Darling shows his contempt for railways and the environment, rail pundit Christian Wolmar slams into Darling’s pre-budget announcement. It’s worth reading the whole article and the follow up comments. The Fact Compiler on the Railway Eye blog also has an interesting take on where those new carriages are going to go. Our last picture stumped everyone for a bit, then Gavin Whitelaw guessed correctly that it was Keen House, the HQ of the Model Railway Club (MRC) The MRC was set up by Henry Greenly in 1910 making it the oldest model railway club in the world. The full answer that we were really looking for was ‘The Model Railway Club’s test track at Keen House’. 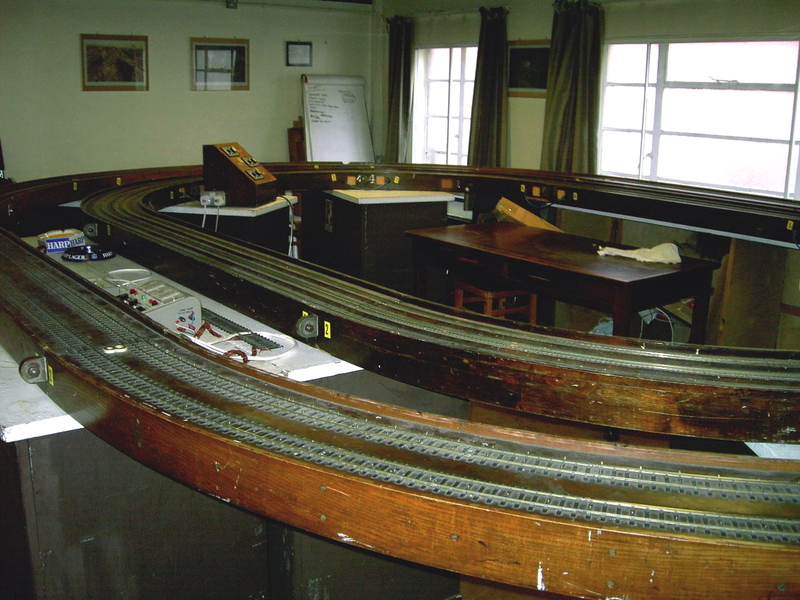 The test track itself is a piece of railway heritage. Look at the blown up version of the photograph. Note the hand-built “O” gauge double track in the foreground with centre studs for power supply and the three tracks “OO” gauge tracks in the centre. Gavin gains an extra point, putting him in joint first place with Gordon Dudman. 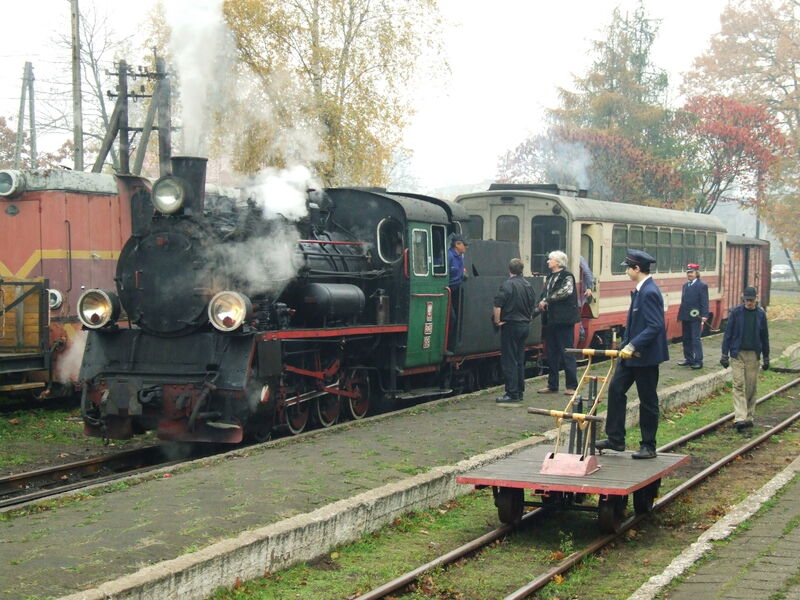 We are very happy to acknowledge the fact that we found the original photo somewhere on the Lithuanian Narrow Gauge Railway Supporters website. But where? Try as we might, we can’t find it again! Stage 2 of the competition is now closed. Now for stage 3. Today’s picture shows a largish UK station a year or so after closure, but where is it and what is the name of the station? Remember to give both parts of the answer accurately to gain both points. The next three pictures will be from Poland to give our Polish readers an even chance. So where’s this? What is this. Dyspozytor’s ‘hump competition’ continues. Part 1 is now closed. We asked, Where is this? What is this? 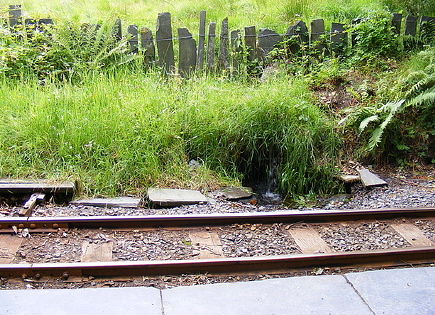 Gavin Whitelaw and Gordon Dudman earned one point each by identifying the location correctly as Dolgoch on the Talyllyn Railway – the first railway in the world to be ‘rescued’ by volunteers. Each then received a reminder that they should also try to identify the subject of the picture more precisely. Gordon identified the water rushing out of the hillside as the ‘water extraction point’ for the old water tower and gains an extra point. BTWT acknowledges the use of one of zadabiel’s Talyllyn Railway photographs on flickr in our previous competition post. (Details of licensing here.) However, the competition continues, there’ll be more questions and even if you didn’t succeed first time round, there’s still time for you to fight your way to the top. So what about today’s picture? (Click to see an enlargement.) With the two ashtrays in the middle ground, the dark varnished furniture, and the railway layout bridging the gaps between the furniture, it looks like Dyspozytor’s dream pub. Tell us where it is and what it is and you could earn two points. The 760mm gauge Pinzgauer Lokalbahn runs from Zell am See to Krimml in Austria. It still operates timetabled passenger services, as well as regular freight services, and steam-hauled tourist trains in the summer months. Bertsdorf Station on the Zittau Railway. Zittau, which is situated in what was once East Germany, is only a couple of miles away from the Polish border, but its 750 mm gauge railway line, the Zittauer Schmalspurbahn could be 1,000 miles away. When Deutsche Bahn, the state railway operator, announced that the line was due to close in 1998, the local authorities at parish, town and county level combined togeher to form the Sächsisch Oberlausitzer Eisenbahn Gesellschaft (SOEG) to act as the custodian and operator of the railway. As the picture shows, with the help of funding from the local authorities, the SOEG maintain the track in tip top condition. There is also an active support society, the Interessenverband Zittauer Schmalspurbahnen (IZS). Perhaps SKPL should seriously consider taking its most difficult local authorities on a short trip to East Germany? Zubrowka is the queen of Polish vodaks. The recipie dates back to the 16th century, and by 18th century Zubrowka was one of the favourite raw drinks of the Polish nobility. In 1926 the Polmos company in Brzesc Litewski, Poland – now Belalco (Brest) Belarus – came up with a way to mass produce Zubrowka. The original distillery in Brest, Belarus, still produces Brestskaya Zubrovka while the grass inside a bottle is the registered trademark of the Polmos Bialystok company in Poland. Zubrowka is rye distilled wodka 40% (ABV) alcohol. It contains an extract from Hierochloe odorata (Bison Grass) which grows in the Bialowieza Forest, which is partly in Poland and partly in Belarus. The Bialowieza Forest is famous for the 600 mm gauge Bialowieza Forest Railway which is the home of HF class, Tx-1112, until recently the last working ‘Feldbahn‘ steam locomotive in Poland. In the USA, Coumarin, the active ingredient in Bison Grass is prohibited as a food additive by the Food and Drug Administration. Polmos produces a bowdlerised version of Zubrowka called ‘Bison Grass Vodka’ containing artificial flavourings and colourings specially for the American market. In our picture Marek Ciesielski holds a bottle of Zubrowka. BTWT readers will recall that Marek’s prize from our last competition was half a bottle of Zubrowka. (He only got half the questions right.) The team of SKPL managers in the picture gamely volunteered to help Dyspozytor ensure that Marek did not consume more than his 50% share. He reports that he and the the volunteers carried out their responsibilities with great enthusiasm and even exceeded their quota! A1 class pacific, 60163 Tornado northbound at Durham Station at approx. 20:00 hrs on the evening of 18 November 2008. Picture from a You Tube video by SiriusHardware. Tornado, the A1 Steam Locomotive Trust’s £3 million new build express steam locomotive, has completed its programme of trials on Network Rail tracks. Tornado was issued with her Engineering Acceptance certificate on Friday 31st October by Delta Rail and her Route Acceptance certificate on Monday 3rd November by Network Rail. On Tuesday 4th November, Tornado made her first main line test run with support coach from York to Scarborough and return. On Thursday 6th November 2008, Tornado hauled a non-passenger carrying test train which run at up to 60mph. Finally, on Tuesday 18th November, Tornado hauled 10 carriages plus a class 67 diesel locomotive, equating to about 550 tons from York to Newcastle-upon-Tyne and return 2008. This test train, was sponsored by National Express East Coast, and ran at up to 75mph (120 km/hr). With the programme of tests complete, the Trust plans that Tornado will start hauling revenue-earning passenger trains in the New Year. However, with the engine throttled back to a maximum of 75mph it is unlikely that the locomotive will ever be able to show off her true potential on British tracks. When Tornado was being built, the A1 Steam Locomotive Trust entertained the hope that, as a ‘new-build’ loco, Tornado would be certified to run at 90 mph (145 km/hr). Maybe, bringing Tornado to Poland would be the answer? Howard Jones of Wolsztyn Experience has agreed with PKP that a properly certified British loco could run at 100 mph (160 km/hr) on a particular section of Polish track. So how about it, A1 A1 Steam Locomotive Trust? When you have finished running in and shaking down 60163 why not ship it over to Poland and show the world what a modern Peppercorn designed, A1 class pacific is really capable of? I understand that Wolsztyn Experience are even willing to sponsor the shipping costs. Now if WE organised a series of high speed runs for Tornado on the Poznan-Warsaw main line, would I pay £50 to travel at 100 mph plus behind 60163? You betcha! I suspect that skilfully marketed, such a venture might even end up making a profit! Watch the video by clicking on the picture at the top of this post. You’ll be amazed how quietly 60163 runs. Dyspozytor loves competitions. He was in a really bad mood following yesterday’s article about how Turek Town Council are trying to fleece the Kaliska Kolej Dojazdowa for rainwater tax. After working it off by yelling at everyone in BTWT’s office we calmed him down by getting him to fill in the Daily Telegraph’s Rail Europe competition. Now he’s ordered another BTWT competition to cheer himself up. Let’s choose a famous railway landmark, that everybody will know, and see a picture taken really close by that will confuse almost everyone. No sooner said than done. So who is going to be first to identify the railway installation in this view and tell us how it relates to the famous railway landmark? Prizes? Who said anything about prizes? The pure joy of winning is its own reward. However, if any BTWT reader wishes to donate a couple of bottles of Zubrowka, we will see that one of them will reach the prizewinner, if there is one. Incidentally the winner of our last competition, Marek Ciesielski, is still waiting for his miniature bottle of Zubrowka, but we are assured by Dyspozytor that he will finally receive his prize this Friday. Marek only got 50% of the questions right and so Dyspozytor claims that he doesn’t qualify for the whole bottle which he drunk last time he (Dyspozytor not Marek) was depressed. Incidentally, SKPL have identified Marek as the photographer of the wonderful atmospheric photos which we reproduced in our More from Smigiel post. They are now properly credited, but when we received them they arrived without any details and we could not caption them correctly. If you think you know the answer to today’s competition, please e-mail it to: railfan(at)go2.pl replacing the “at” with the ampersand symbol. 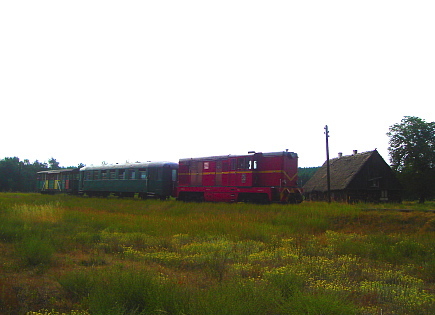 A special train stops at Dzierzbin on a July evening in 2006. Photo BTWT archives. 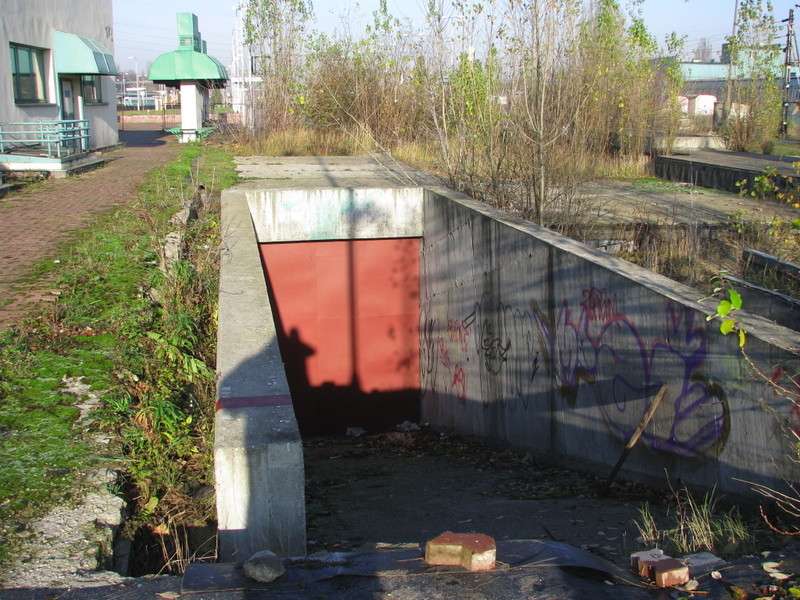 A 20,000 PLN ‘rainwater tax’ demand from Turek Town Council’s Water and Drainage Department has caused SKPL bosses to contemplate the abandonment of the northern section of the Kaliska Kolej Dojazdowa (the Kalisz narrow gauge railway) which currently runs from the PKP interchange sidings at Opatowek to Turek. At a meeting with Krzysztof Nosal, the Chairman of Kalsz District Council, which took place yesterday, a number of long-term development options were discussed for the future of the railway including the availability of EU funding to upgrade the line and even the possibility of restoring the link back into Kalisz itself. In view of the tax demand from Turek, the option of abandoning the section which runs through the area administered by Turek District Council was also discussed. Joined up thinking is never a strong point of governments, but when the Polish Government passed the Act on the Commercialisation, Restructuring and Privatisation of Railways, common sense was in short supply. The Act allows a local authority to take over an unused PKP railway subject to the condition that it will used for transport purposes, even if the railway runs through territories administered by other local authorities. Sadly while roads are exempt from local taxes, the new Act did not make the same exemptions for railways. Warsaw to Lodz faster in 1934! The PESA ‘Lodz tram’ at Warszawa Centralna. I’m not known for being excessively emotional, but the new PESA trains sets, that work between Lodz Fabryczna and Warszawa Centralna, have seriously ‘stroked my fur the wrong way’. I hate them with a cold fury that I’m sure is bad for my blood pressure and leave my friends shaking their heads in disbelief. I hate them because, in spite of their streamlined looks, they crawl along on the brand new, trillion PLN, railway between Skierniewice and Lodz Widzew at an average speed which is less than that achieved by the Great Western Railway’s Bristolian in 1935. I hate them because of the design of their reverse curved back-breaking seats, which no one in PKP has had the courage to rip out and replace with seating that is properly ergonomically engineered. I get by by trying to ignore the existence of the ‘PESA trams’, preferring to travel between Lodz and Warsaw in one of the three real trains that travel between Lodz Kaliska and Centralna. My journey takes a little longer because the Kaliska trains take half an hour to wind round the broken track between Lodz Kaliska to Lodz Widzew, but the slightly faded ancient compartment stock, which goes to such distant places as Bydgoszcz or Szczecin, is infinitely more comfortable to the ‘trams’ with their cursed seats. Sadly there is not always a real train alternative available and sometimes I do have to travel in the new train sets. Yesterday evening was one of those times when I found myself on board to the 19.20 ex Warszawa Centralna which was due into Lodz Fabryczna at 20:50, a journey time of 90 minutes. I made my way to one of folding seats near the high tech toilet. Undignified maybe, but at least the folding seats assume a normal back profile. As a result of customer complaints the rest of the seating had been ‘improved’ since my last journey. The seats, are not only the wrong shape to support a human back, they are also too small to fit the XXL standard Polish buttock. The ‘improvement’ consists of transplanting the old seats some 6 centimetres away from the sides of the train giving the passenger on the inside a little extra space. So now you can have your back broken while respecting your neighbour’s dignity. The high tech train information boards – though more concerned with giving you information about whose namesday it is – occasionally flash up the train speed. Last time I travelled I noted a maximum speed of 137 km/hour (85 mph). This time the highest speed that we reached was 129 km/hour (80 mph). I challenged the guard about this and learned that Polish railway regulations prevent trains with a single driver in the cab from exceeding 130 km/hour. The PESA train sets are not designed for a ‘second man’ sitting next to the driver sharing his duties. I ruminated that after an expenditure of over a trillion zloty the train still did not complete the journey in the 80 minutes achieved by the in the Lux Torpeda in 1934, or even the 88 minutes achieved by the locomotive hauled Tellimena Express in the 1990s. Nottingham Tram Consortium’s administration team won the ‘Team of the Year’ award while NTC was highly commended (runners-up) in the Operator of the Year (having won this title last year) and Safety Initiative of the Year categories. The black-tie Light Rail Awards, hosted by BBC’s Nicholas Owen at the Café Royal London on October 8th recognise excellence in operators and industry suppliers. NTC’s administration team is only eight-strong, but between them they are responsible for an unenviable number of duties – among them answering the customer telephone helpline, investigating complaints, administering accounts, staff rosters, revenue, insurance, engineering and human resources. Despite the workload, the team has sustained annual performance monitoring system compliance for answering customer queries within strict time guidelines of between 98.5% and 100%. 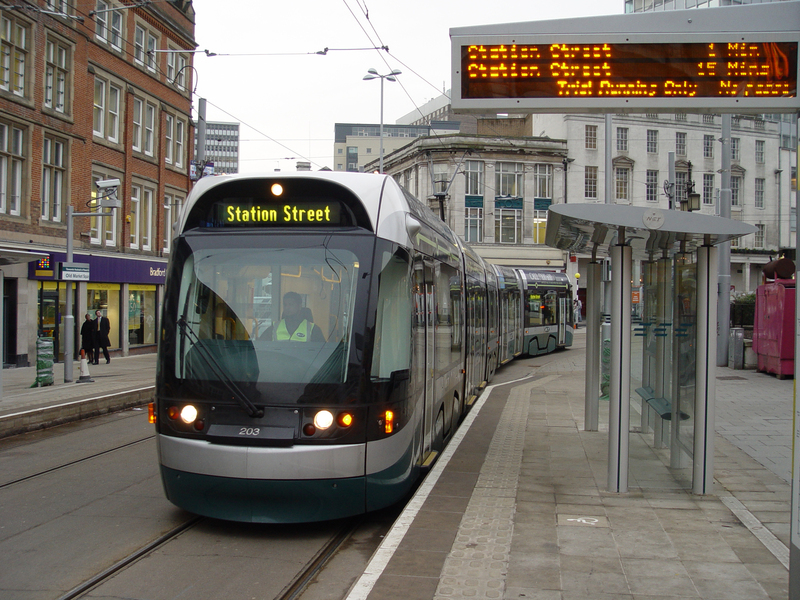 This compliance has been recorded and checked monthly since trams began operating in Nottingham in 2004. More than 38 million passengers have been carried since then. Polish passenger and freight operators would do well do learn about the importance of maintaining a well motivated team which takes care to look after its customers. 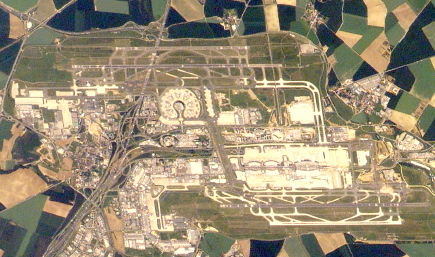 Charles de Gaulle Airport, near Paris. Faced with overwhelming opposition from local residents, the London boroughs, other affected local authorities and the majority of MPs to the idea of building a third runway at London’s Heathrow Airport, what does Gordon Brown intend to do? Why build a third runway, that’s what! During a Parliamentary debate that took place on Tuesday 11 November, the overwhelming majority of backbench MPs as well as the frontbench Conservative and Liberal speakers expressed themselves unreservedly against the idea of a building a third runway at Heathrow Airport. For those without the time to read the full transcript of the debate the following selection from the speeches of Geoff Hoon, (Secretary of State, Department for Transport; Labour), John Gummer (backbench Conservative), Norman Baker (Shadow Secretary of State for Transport, Transport; Liberal Democrat), John McDonnell (Hayes & Harlington, Labour) and George Young (North West Hampshire, Conservative). Teresa Villiers MP, for Chipping Barnet and the Conservative Shadow Secretary of State for Transport, argued eloquently in favour of ditching plans for a third runway at Heathrow and linking Heathrow to a new UK high speed rail network. She maintained her composure in the face of many government sponsored interruptions. Serious students of the Heathrow expansion project are encouraged to read her arguments against the third runway and those of many other MPs in the full Hansard transcript of the debate. What does he then do? He goes to Copenhagen and says, “What I want you to do is to follow the British route. We are going to build a new coal-fired power station in Kingsnorth without any kind of carbon capture or sequestration. We are going to expand the airport at Stansted. We have already increased the number of airplanes there. What is more, to show our commitment to the battle against climate change, we are going to have a third runway at Heathrow.” What kind of leadership is Britain going to be able to provide in Copenhagen if the Government fail to understand that joined-up thinking is a necessary part of fighting climate change? Heathrow will carry on as a major airport. Despite all the doom and gloom from the Government, it will not suddenly shut down if it does not get a third runway. It will carry on at, or near, capacity. We need to deal with the situation of passengers arriving at Heathrow who currently find it most convenient to transfer to another aircraft, so that in future they transfer to rail. That requires plugging in the high-speed network with Heathrow in a way that facilitates such journeys, so there is one more leg to go. That would be a sensible way forward. The Secretary of State was keen to talk about the 2003 White Paper, but, as Mr. Gummer pointed out, so much has changed over the last five years. After all, the Government’s 2003 energy policy was against nuclear power, and we are now told that it is the best thing since sliced bread. They have managed to change on that in the past five years, but they have not changed on aviation. Why not? Exactly so. A lot of things have changed since 2003, including that a much stronger case is now being put for high-speed rail by Network Rail and others, which means there is a capacity for modal shift that was not anticipated. I do not mind the Government being committed to a 30-year long-term air strategy—the Secretary of State said it would be long term—but why does the rail strategy run out in 2014? Why are there no plans beyond 2014 to improve our railways? We have some longer platforms and trains now, but there are no plans beyond 2014—no lines opening, no commitment yet to high-speed rail, no electrification. A lot of things have been talked about, but nothing has been delivered on beyond 2014. Why is it right for air to have a long-term strategy, but not railways? That shows the unbalanced way in which the Department for Transport has addressed transport policy over the years: it has been roads, good; air, good; rail, bad; bus, bad. That simplistic way of looking at matters accurately reflects how the Department has dealt with transport policy. I am arguing for reaching some form of consensus across the House about the way we approach the issue. This is such a big decision that it needs to be taken out of the party political knockabout arena. We need to have a discussion. I dislike the tenor of the debate on both sides of the House, not only because of my constituency interests but because of the significance of the decision, which I mentioned. The onus is on us to treat the matter seriously and see whether we can find cross-party agreement. The alternatives that have been put forward deserve better analysis. I actually think that the Marinair proposal that the Mayor [Boris Johnson ed.] has now taken up was dismissed too lightly in the assessment in the White Paper. I also believe that the Government dismissed too lightly the idea of developing a proper regional airport strategy linked to a high-speed rail system. Let me briefly go through the arguments and look for a way forward, and let us see whether we can get some agreement. This is a major decision that will, as the Secretary of State said, affect the long-term interests of our economy. It will also make or break our climate change policy. It has immense economic consequences not only for London and the south-east, but for the country as a whole. If we are good Europeans, we should look to the overall implications for European economic and transport policy. The policy will cause immense social division within the country. Many people are disillusioned with the whole process of consultation, assessment and policy making that the Government have undertaken. They are angry, and the anger is building. I believe that it is building into a form of direct action the like of which neither the Government nor the country have ever seen. We saw what happened at the climate camp, but Heathrow is becoming the iconic battleground for the climate change campaign, not only in Britain but throughout Europe. Forging ahead with a decision to expand Heathrow will sow social division; it will divide our country and bring us into conflict in a way that we have not seen before. We need to take the decision out of the political knockabout arena. We should accept that events have moved on since the 2003 White Paper. The Government have introduced a new Planning Bill. We were given assurances on the Floor of the House that if the Heathrow decision was taken under the procedures in that legislation, there would have to be a new national policy statement. If the decision is not taken under the new legislation, we will go back to the old planning inquiry system. The process for terminal 5 lasted five years, and on that basis the process for terminal 6 and a third runway will probably take seven years. We should commence cross-party discussions about the development of a new national policy statement on aviation, and see how times have moved on and how Government climate change policy has changed. We should set up an independent—properly independent—review of aviation strategy and decide where the Heathrow decision fits into it. On that basis, we can at least attempt to seek consensus on this critical decision. However, if the Secretary of State thinks that he can railroad the decision through the House without a Division, he is sorely mistaken. The least the Government can promise us is that any final decision will be taken democratically, by this House, in a Division, on the basis of the decisions that our electorates made to have us represent their interests in this matter. Today, international travel is no longer the preserve of the wealthy, although it is fair to say that the better-off are taking advantage of far more flights than even they might have made in the past. However, the real point is that everyone is benefiting. The number of international flights taken by UK residents more than trebled between 1986 and 2006. That meant that in 2006, UK residents made on average one international flight a year, whereas in 1986 that figure was one flight between three people. In the past 12 months, more than half the population took at least two flights. To illustrate what that means in practice for our constituents, let me take an example chosen not entirely at random. The latest census data show that the leafy north London seat of Chipping Barnet has a population of 103,000 people. Using those UK averages, we can calculate that more than 50,000 constituents of Mrs. Villiers took at least two flights in the past 12 months. Of course it is also important to bear in mind the fact that some 50 per cent. of the hon. Lady’s constituents are in managerial occupations and so tend to use air travel even more. I hope that the hon. Lady will be explicit to her constituents about the implications of her party’s position: less frequent, less reliable and more expensive flights. Moreover, she will have to explain to her constituents that if she gets her way, instead of making the 25-mile journey to Heathrow, they will have to get used to flying to Paris or Schiphol for a connecting flight. The number of passengers passing through UK airports has also grown rapidly, from 32 million in 1970 to 241 million in 2007, a rise of around 650 per cent. Is it not the case that the growth of low-cost flights has been in flights from airports other than Heathrow? That is of course the case, but the reality is that there is enormous demand for flights from Heathrow that has not been satisfied in recent years. That is precisely why the right hon. Gentleman’s former colleague, the noble Lord Mawhinney, made the statement to which I referred earlier. The right hon. Gentleman’s Government—the Government whom he consistently supported—were looking at capacity in the south-east in the early 1990s. He knows that full well. 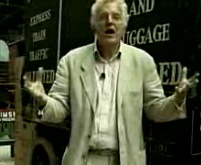 Therefore, as a distinguished Member of the House, he ought to be able to explain rather more effectively than those now on his Front Bench why his party’s policy has changed so dramatically on the basis of a massive increase in the number of flights, albeit without any explanation of how that capacity will arise. Our policy has not changed as a matter of fact, but may I draw the Secretary of State back to the 2003 White Paper, on which he has predicated so much of his speech today? Does he not accept that the world has moved on significantly since 2003, both for the reasons that Mr. Gummer gave and because of the potential for high-speed rail and the developments in transport elsewhere? It is simply unwise to rely on a 2003 White Paper to work out what should happen to aviation in 2008. Will he therefore revisit the major concerns, rather than concentrating this debate solely on the environmental consequences, important though they are, for the communities around Heathrow? If the hon. Gentleman has studied the White Paper as carefully as I hope he has, he will have noticed that we are talking about the requirements for this country’s aviation to 2030. As I have referred to the previous Conservative Government looking into capacity in the early 1990s and concluding by 1995 that Heathrow was already full in a practical sense, let me make it clear that even if we decided to go ahead today, which clearly we will not, it would be at least 2020 until a further runway was available and a further terminal constructed. That means that some 30 years would have elapsed on a decision that was being considered by the previous Conservative Government in the early 1990s. It is therefore wrong to suggest that the issue can be determined on the basis of this year’s or next year’s forecast. We are talking about a strategic decision. It is disappointing that the Conservative Opposition have, if the hon. Gentleman will forgive me for saying so, simply adopted the rather short-term approach that is characteristic of the Liberal Democrats. In the strange way that Parliamentary democracy is practised at Westminster, the house did not divide on whether or not the third runway should actually be built, but on the procedural motion, That this House has considered the matter of adding capacity to Heathrow. Any BTWT readers who believe the Government’s argument that Heathrow needs a third runway to remain competitive with other European ‘hub’ airports should reflect on the fact that Charles de Gaulle Airport near Paris is about to start construction of its fourth runway, and is already on the TGV high speed rail network. Evening shadows at Stare Bojanowo, 8.11.2008. Earlier in the day at Smigiel 8.11.2008. We just been sent a couple of photos from the Smigiel open day and thought we should publish these. Unfortunately thee-mailer didn’t identify the photographer, but we should be able to add the details in the next 24 hours. ‘Luxtorpeda’ prototype at Cracow in the late 1930s. Andy Bereza has e-mailed us about a recent post in the Modern Mechanix blog quoting a June 1936 article in Popular Mechanics. Poland’s “torpedo train,” a streamline rail car that travels ninety-three miles an hour, bears the reputation of being one of Europe’s speediest trains. It is driven by a Diesel motor with automatic clutch, operating on an extremely economical basis. The car, one of several in service on Polish railroads, carries eighty-six passengers. The Polish ‘Luxtorpeda’ was based on the Austro-Daimler VT63 petrol engined railcar. PKP leased one of these railcars in 1933 and after trialing it on a number of lines purchased a license to build the railcar in Poland. 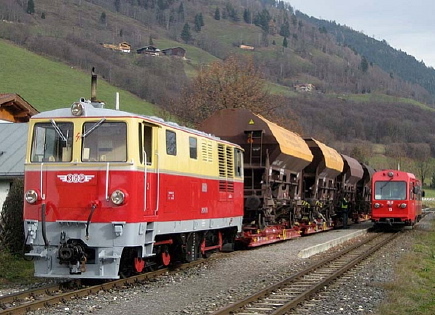 The Polish version was built by Fablok in Chrzanow and incorporated two MAN AG D4086 123 hp diesel engines in place of the two 79 hp petrol engines of the Austrian prototype. 5 Polish railcars were built. The main features of both versions were the massive 1030 mm dia wheels and the low 2.64 m height, This kept the centre of gravity low and allowed the train to take curves at a higher speed than ordinary trains. Published sources give the seating capacity variously as 60 or 52 and the top speed reached in trials as 75 mph (120 km/h) with a maximum operating speed of 65mph (105 km/h). So it would appear that the pre-war PR department of PKP, by quoting from original design targets rather than actual operational results, were guilty of some spin. Nevertheless in 1936, a Polish-built ‘luxtorpeda’ ran the difficult 91 mile (147 km) route between Zakopane and Cracow in 2 hours 18 minutes, setting up a record which has yet to be beaten! Two ‘luxtorpeda’s survived the German attack on Poland and operated ‘German only’ trains between Cracow and the mountain resorts of Zakopane and Krynica. After the collapse of Germany they were returned to Cracow by the Russian army in a very incomplete state and one railcar was rebuilt using the best parts from both. Sadly, the backlog of maintenance, and lack of proper spare parts meant that the surviving railcar could no longer run at anything like its design speed and so it was relegated to local duties. Both railcars were cut up in 1954. 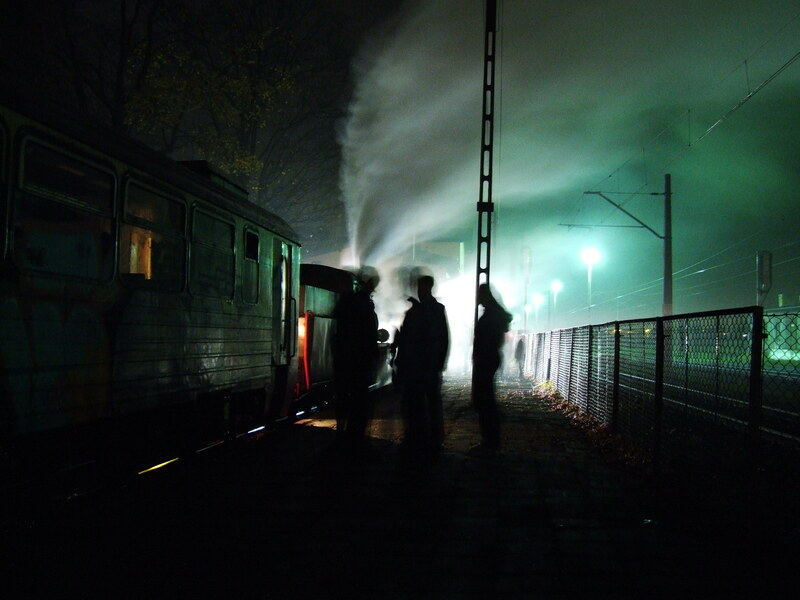 Polish autumn, Smigiel Railway 8 November 2008. Click to see photo in higher resolution on world rail photo website. It started as an idea of Howard Jones to run an extensive service of steam trains on the Smigiel Railway on 8 November, the last day of this year’s steam services. SKPL, the line’s operator, thought that this would be an excellent opportunity to gain some publicity and to cement relations with the local community and Smigiel Council. Posters were printed. A prize draw was organised. Discreet phone calls were made and official invitations sent out to council members. The result exceeded everyone’s expectations. The trains which ran from 07:00 to 21:00 hrs were all packed. Over 400 draw tickets were sold. The whole council turned ouit in all their splendour. The deputy mayor handed over the winning prize. For a very modest expenditure to cover the publicity costs SKPL gained itself a few extra brownie points and the railway achieved a much higher profile in the eyes of the local council. SKPL is now rethinking its PR strategy for its other railways. Congratulations to Howard Jones of Wolsztyn Experience and Tomasz Strapagiel of SKPL for their initiative and to Marek Ciesielski and Lidia Kreuschner for actually making things happen on the ground. I would have liked to have posted a picture of the crowds at Smigiel listening to the speeches by the VIPs, but unfortunately all that I have been able to find are some more picture of PX48-1919 taken on the day.